Although a person is never too old to start an orthodontic treatment, treatments in adults are sometimes more complex following a progressive deterioration of the state of their mouth. The following are points about imbalances between jaws and the surgery. When jaw growth is completed, if a significant imbalance is present, a surgery may be necessary to correct it. The most common problem in the North American population is a receding lower jaw (mandibular retrognathia). It is also possible to see jaws (upper or lower) that are too advanced, too far back, too wide, too narrow or a combination of these problems. Orthodontics corrects dental malpositions responsible for malocclusions (teeth that are crooked, crowded, protrusive, tipped, etc.). 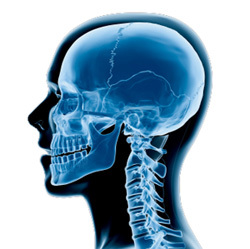 However, a specialist in maxillofacial surgery is required to intervene in severe jaw anomalies. Orthognathic surgery aims at correcting imbalances between the jaws that are too severe to be corrected only by an orthodontic treatment. Well-balanced jaws are essential because they are the foundation of a good occlusion. The orthodontist and the surgeon then work as a team to elaborate a treatment plan that will make it possible to correct the occlusion and the jaw problems. Jaw anomalies are mainly caused by heredity, but can also be the result of traumas (accidents) or growth defect. Surgical corrections make the jaws more functional while improving dental health, occlusion, esthetics and facial appearance. Orthodontic treatments combined with surgery are done in steps. The initial step is the orthodontic preparation when fixed corrective appliances (braces) are used to align the teeth and prepare the dentition for the surgery. This step can take 12 to 18 months in average. The surgical phase, performed by a maxillofacial surgeon, aims at correcting the position of the jaws once the teeth are aligned. After the surgery, the orthodontic finishing phase aims at completing the dental corrections to improve the occlusion and ensure the stability of the jaws. This step lasts a few months. If a surgery is indicated, it is usually required to use orthodontics as well to correct the dental malpositions before correcting the relationship between the jaws. Jaw surgeries involve certain inherent normal risks to any surgical intervention. A general anesthesia is required for orthognathic surgeries, which also involves certain risks. These interventions are performed by experienced surgeons; they have been performed for several years and they are now considered routine surgeries. You will meet a maxillofacial surgeon who will explain the planned intervention in details, as well as its risks and benefits and will answer all of the questions you may have about the surgery. In Quebec, most major jaw surgeries are covered by the Régie de l’assurance maladie du Québec (RAMQ). However, some fees, that are not covered, have to be paid by the patient to the surgeon. A consultation with the surgeon will give you all the information about the financial aspects of the surgeries. The following examples show imbalances between the jaws that necessitate an orthodontic treatment and a surgery to one or both jaws. Severe mandibular retrognathia (receding lower jaw) in a 31-year-old patient. The lower teeth bite into the palate and the upper teeth are sticking out by 14 mm. A surgery is necessary to move forward the lower jaw that is too far back. Profile showing a receding chin. The radiograph shows a receding mandible that is also too short and contributes to the significant gap between the upper and lower teeth. The diagram shows the movement that must be performed with a surgery to move the jaw forward. After the orthodontic treatment and lower jaw advancement (surgery), the face profile, the esthetics and the function of the dentition are significantly improved. The intervention that is the most performed by maxillofacial surgeons to correct anteroposterior (front-back) mandibular skeletal imbalances is called a mandibular bilateral sagittal split osteotomy. This intervention makes it possible to move the mandible forward and lengthen it in cases where it is too short (mandibular retrognathia, Class II cases) or to move it backward and shorten it if it is too long (mandibular prognathia, Class III cases). This intervention can often be performed together with different types of osteotomies to the upper maxilla if indicated. The illustration below shows a mandibular bilateral sagittal split osteotomy. The arrows indicate the possible directions of the mandibular segments once the osteotomies (cuts) are done. (A) The mandible can be moved forward and “lengthened” if it is too short (Class II – mandibular retrognathia). (B) In Class III cases with mandibular prognathia, the mandible can be moved backward and shortened. A bone segment must then be removed. (B and C) In addition to being able to move the segments anteroposteriorly (front-back), they can be vertically repositioned (in height) and a certain rotation or torque can even be introduced to optimize the new relationship between both jaws. (D) Once the segments are well positioned, they are immobilized with rigid fixations (screws inserted into the bone) that maintain the bone segments stable during healing. ➡ To see a video showing a surgical mandibular advancement to correct a mandible that is too far back (mandibular retrognathia). 22-year-old patient complaining about his gummy smile (pictures before the treatment). Significant reduction of the visible gum following a surgery to the upper jaw. Orthodontics (4 teeth were extracted) made it possible to align and move the teeth backward. (Final) Closing of the anterior open bite following the orthodontic treatment and a jaw surgery. This results in a better function (mastication and phonetics). The traditional approach to correct a severe anterior open bite, caused by a vertical maxillary excess, also known as posterior maxillary overgrowth, is an orthognathic surgery called “maxillary impaction”. This procedure consists of removing a bone segment of uneven height at the front (less) and at the back (more) (differential maxillary impaction) to allow the repositioning of the maxilla by moving it more posteriorly. Upper impaction allows the mandible to close more and to slightly move forward following a counterclockwise rotation (mandibular autorotation). The segments are fixated using surgical plates put in place with screws. These plates are usually left in place unless they cause problems to the patient afterward. (A) Anterior open bite caused by a posterior maxillary overgrowth. The posterior teeth are the only ones to touch when the mouth closes. (B) Cut for a differential maxillary impaction. The red part will be removed (ostectomy). (C) The maxillary segment is moved upward and fixated with plates and screws. This results in a mandibular auto-rotation that moves the lower dentition upward and forward. (D) Once the treatment is finished, the open bite is closed and all the teeth touch. Severe anterior open bite necessitating an orthodontic treatment and a surgery to correct the bad relationship between the jaws in a 17-year-old boy. Closing of the anterior open bite following the orthodontic treatment and a jaw surgery. This results in a better function (mastication and phonetics). 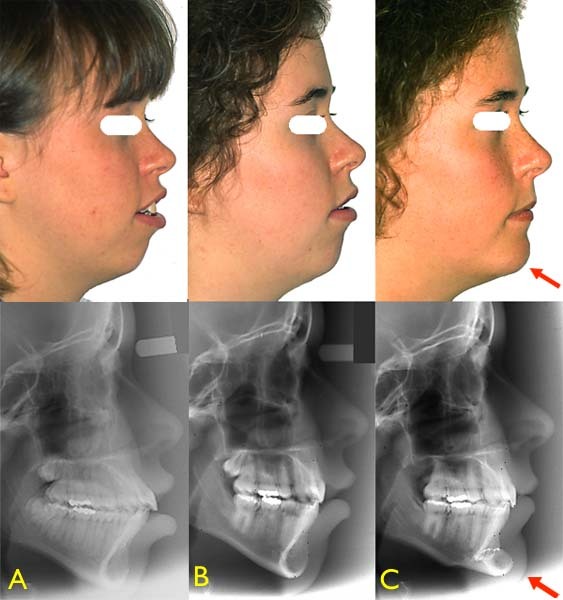 Radiographs before and after the surgery and diagrams illustrating the jaw movements. (A) Severe Class III malocclusion with maxillary constriction, bilateral crossbite and posterior open bite and a significant lack of space. (B) The maxillary deficiency (constriction and receding upper maxilla) is reflected in the receding upper lip. (C) Occlusion at the end of treatment. A surgical maxillary advancement was required to move the upper jaw forward and improve the profile. No extractions were necessary and no expanders were used. (D) The final result shows a more advanced upper lip and a profile that is better balanced. Sometimes, it is not required to undergo a surgery that aims at moving the whole lower jaw forward in order to change the appearance of a chin that is too far back or weak. A chin advancement surgery (advancement genioplasty) can make it possible to obtain significant esthetic changes as shown by this example. (A) 45-year-old woman with a weak chin. The upper jaw was “moved upward” (maxillary impaction) and chin advancement (genioplasty) was performed to give more volume and improve the profile. (B) The retention surgical plate and screws of the chin (arrow), as well as the screws in the upper jaw, are visible on the postoperative radiograph. To see more cases of chin surgery. To see more cases treated by an orthodontic treatment and surgery.